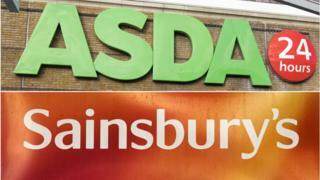 Merger talks between British supermarket chains Sainsbury's and Asda are at an "advanced" stage, Sainsbury's has confirmed. The two brands are expected to be retained should a merger go ahead. Sainsbury's and Asda - the UK arm of Walmart - are the second and third largest supermarkets in the UK. The combined group would comprise 2,800 stores and would represent 31.4% of the UK grocery market - slightly more than that of market leader Tesco. "Sainsbury's confirms that it and Walmart Inc. are in advanced discussions regarding a combination of the Sainsbury's and Asda businesses," a statement from its holding company, J Sainsbury plc, said. The deal would be worth £10bn and a further announcement is expected on Monday morning. Richard Lim, from economics research consultancy Retail Economics, said the merger would be a "game changer in the UK grocery market of epic proportions". "The potential tie-up would see the combined business take Tesco head-on," he added. But Richard Perks, director of retail research at Mintel, thought it was a bad deal. "Even if you retain both brands, as soon as you try to bring them together and get some sort of cost savings, you will end up undermining both sides," he told the BBC. Could the big four become the big three? All the main supermarket chains have been looking to find new sources of growth because there's not much of it around their own aisles. Asda had been the poorest performer of the big four. The industry has been wondering what its big strategic move might be. Now we know. If this merger goes through, it will be the biggest shake up in UK grocery retailing since Morrisons took over Safeway in 2004. George MacDonald, editor of Retail Week, said the grocery industry had been shaken up by low-cost supermarkets such as Aldi and Lidl. "So maybe this type of mega deal will get the go ahead by the Competition and Markets Authority," he said. "This is quite audacious by Sainsbury's - given it has only recently bought Argos. It's symptomatic though of the restructuring of the supermarket industry." Lib Dem leader and former business secretary Vince Cable has said there must be an immediate investigation by the Competition and Markets Authority. He said the potential merger threatened "the creation of even more concentrated local monopolies". Shadow business secretary Rebecca Long-Bailey agreed, adding: "It will be British shoppers that suffer from rising prices... if this goes ahead without adequate oversight and investigation." Sainsbury's took over catalogue retailer Argos and Habitat for £1.4bn in 2016. In 2017, Tesco merged with Booker - the UK's largest food wholesaler. The two parties realise that the Competition and Markets Authority (CMA) will have some serious questions to ask. Sainsbury's concedes that some store disposals will be required to satisfy them, so the 30% market share figure may well go down. Having said that, sources close to the deal say the market has changed in the last few years and point to the Tesco Booker merger as evidence that the CMA understands that. Sainsbury's is continuing to integrate Argos into its network and sees an opportunity to roll out Argos in Asda stores. The two brands will be retained as they appeal to a different customer but they see a good geographical fit, with Asda stronger in the north and Sainsbury's in the south. The shop workers trade union Usdaw has said it is seeking urgent talks with Sainsbury's and Asda over the protection of jobs. Asda was founded in Yorkshire in 1965. It was bought by US retail giant Walmart in 1999. The first ever Sainsbury's store opened in 1869 in London's Drury Lane. Qatar's sovereign wealth fund, the Qatar Investment Authority, is now the supermarket's largest shareholder.